Earlier today I showed you videos of the Kyobo eReader. If you looked carefully you could see that it has a front light on top of the screen. Like E-ink screens, that ebook reader needed a frontlight because it could not use a backlight. Not too long after I posted that, my competition posted a video from FlexLight, a small tech company that has perfected a component that can be built in to any ereader and offer the same feature with a minimal energy cost. Mirasol and Eink are low power screens, but to get the power level down they also gave up the ability to project light. This means that they can only reflect the light that hits the screen. This is a neat component, but unfortunately it won't do any of us much good. It has to be integrated into the device when it is built. And given how tight margins are in the ereader market, I'm not sure that manufacturers will want to increase prices so they can include a front light. And that goes double considering that cases with integrated lights are quite common on the market. BTW, this isn't the first front light that I have seen. It's the best, but I have seen a front light on older PDAs, the HP 360LX, and an old tablet. 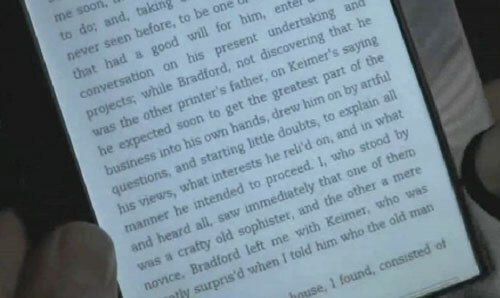 Also, the Sony Reader PRS-700 had a frontlight. It was ugly and didn't offer uniform light, but it did demonstrate the possibilities. What you don´t seem to understand is that the absence of light is a feature, never again do i want to stair into light and strain my eyes.